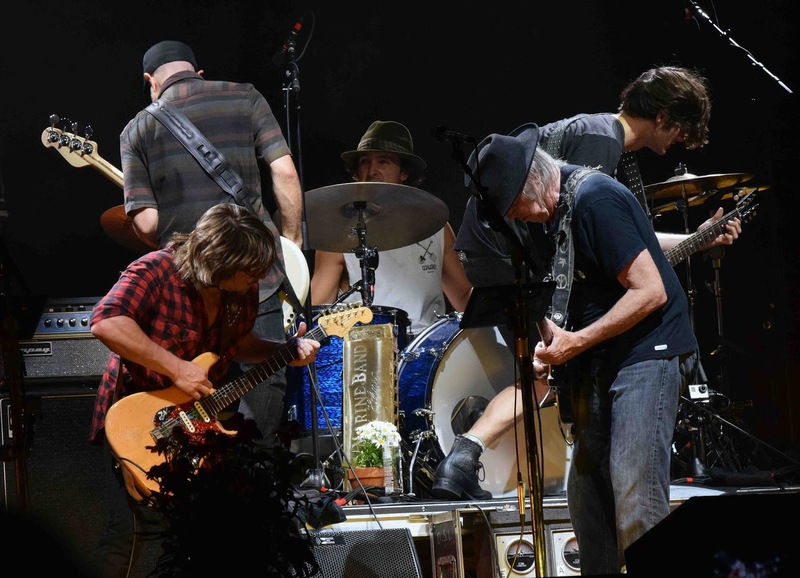 The Photo of the Moment is by Mark Harlan/WBKM.org of Neil Young + Promise of the Real in Essex Junction, VT on July 19, 2015 . Yes, indeed our once young Neil is nearing 70. Well, on Sunday night July 19, 2015, Neil Young proved that 70 is the new 45. Playing with a band of musicians who were just barely born when "Ragged Glory" was released, Neil should have seen that he finally met his match. Instead, what he has met is a group of musicians equally passionate and dedicated and concerned about the future of our world...and as unafraid as he is to speak up about it. Tools sharpened. Prepare to rock. With a balance of fury and delicacy, youthful vigor and appreciation of all that had come before them, Promise of the Real, along with younger brother Micah, gives me a deep hopefulness about the future of music. Sitting behind the band on the drums, Anthony Logerfo is no click track drummer. Strong, talented, self-assured, and always smiling. Tato Melgar on percussion adds a touch of the exotic, just the right amount of Allman Brothers quixotic style. 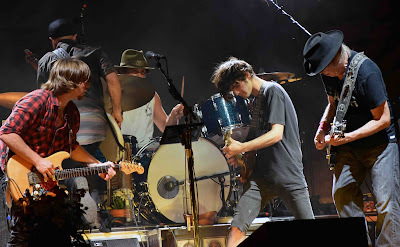 Corey McCormick plays a solid and rhythmic baseline, the perfect bottom laid down as he stands on the stage between Lukas, leader of his band, and Mr. Young, leader of this strange and beautiful new horse of a different decade. The brothers, sons of Neil's Farm Aid cofounder Willie Nelson, bookend the stage in the perfect circle of family. Their bond is beautifully portrayed when Neil introduces a special song, and Lukas, moving to piano, begins the beautiful and emotional "Moonlight in Vermont". It was a very special moment for me, as the language spoken only in the eyes between Lukas and Micah as the song ended, silently given witness by Neil's smile, was unmistakable. "Hey brother, this is just like we used to do with pop, at home, only here we are with Uncle Neil and 10,000 folks in Vermont !" No need to say it out loud. All who know how dear the song is to father Willie could hear it too. Time for some nice non-GMO coffee, don't you think? It's best brewed up by two of my favorite new songs: "A rock star bucks a coffee shop", with the infectious whistles of the four front men standing abreast..."Let our farmers grow, what they want to grow". Then a little later, The very hopeful "Working Man", telling the story that changed the world in 1996... Naming names like Supreme Court Justice Clarence Thomas, a former Monsanto employee clearing the way for patent infringement lawsuits on the sacred seed, giving ownership to what was once given freely from God. "Well I don't know you, but I do know who I am!" Defiant, as Lucas plays the country lead on his Stratocaster with his teeth. He and Cory bouncing like hippie cowboy versions of Tigger. Crazy horse favorites played with great respect and wild abandon...DBTR, with the brothers, Corey and Neil huddled in a tight circle playing their hearts out. The sonically booming "love and only love", ending with Neil standing on the drum riser in front of Anthony, each wild man pulling the last speck of energy from each other's souls. Thanks Tony for the eyewitness report from Vermont!